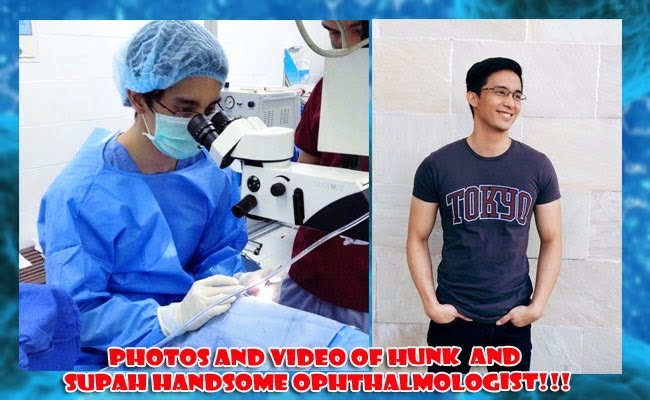 Photos and video of hunk ophthalmology resident, Dr. Mark Agas is making its rounds on Facebook after a Far Eastern University (FEU) student shared the experience of being his patient. The story was originally posted in the Facebook page called FEU Secret File. Dr. Agas works in St. Luke’s Medical Center and also as a print model under Mercator Models Management. In the 28 second video, the hunk doctor in in front of his computer while a patient is talking to him. In the post of Facebook post “Future Lawyer” in FEU Secret File, the experience with the doctor had been narrated. According to the said consultation, “Future Lawyer” had been suffering from blurring of the eyes and opted to have a consultation in the St. Luke’s Medical Center. After being lead to the 32 year old opthalmologist’s clinic, the student tried to colorfully explain the sudden rush of feelings upon seeing the doctor. Dr Agas checked the student’s eyes and suggested the preferred eyeglasses. The post had caught the attention of the netizens and sparked their curiosity, making other photos of the doctor surface in various social media. Others commented saying that they ought to have their eyes check in his clinic. Within three days, the post garnered around 14,000 likes and was shared more than 550 times. Soon it was confirmed that the doctor is already in a relationship with Kara Gozali, a UST medical student and also a print model. Dr. Agas had his undergraduate degree in UP Diliman while he got his medical degree in UST. He then had his internship in Cardinal Santos Memorial Medical Center. He had been in the print ads in magazines such as the Philippine edition of cosmopilitam magazine.